BioVirtua co-hosted a VIP breakfast with parent accelerator Nex Cubed and fellow portfolio company, Trails.ai during the 36th Annual J.P. Morgan Healthcare Conference in San Francisco on the morning of Wednesday, January 10th, 2018. Esteemed guests from all sectors of the healthcare industry attended to discuss emerging technologies in healthcare and it’s changing landscape. 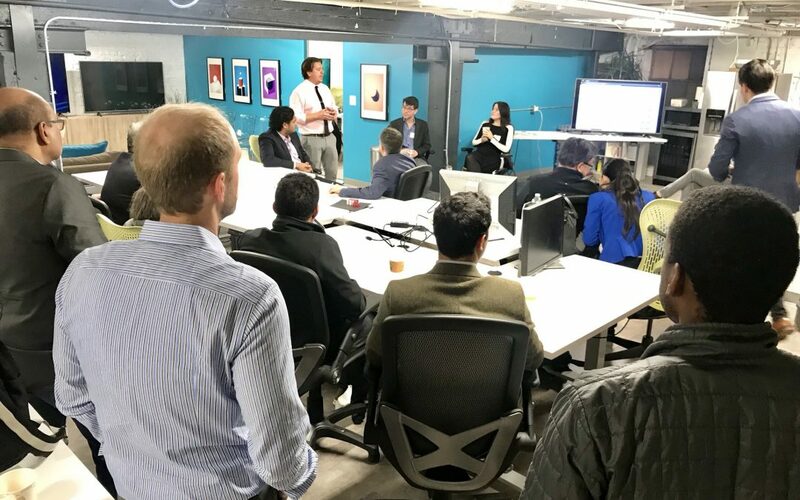 Representation from providers, payers, healthcare investors and technology companies helped kick off a stimulating discussion after an introduction of the two portfolio companies in the panel. Out of that discussion, the group arrived at multiple key takeaways which we are sharing with you. Both BioVirtua and Trails.ai are using technology to make the process of healthcare easier to navigate by all stakeholders, especially patients. And patients derive more value out of the process when they are engaged in the discussion and the process of delivering care. Thus patient engagement became the first topic of discussion for the guests and the panel. Traditionally the focus of healthcare innovations have been on the payer or pharma, but recent emphasis on engaging patients and providers has taken center stage. Unfortunately, patient engagement has become a buzzword, much like machine learning and artificial intelligence, with lack of consensus of what it looks like in the field. Guests were invited to share their experiences and insights on the matter. Kim Walpoole, co-founder and CEO of Trails.ai started the topic’s discussion by sharing her experience of speaking with providers who claimed to practice patient engagement but tended to define it with a very narrow scope such as using SMS to communicate with patients. Such a definition does not address the true objective of patient engagement, which is to alleviate patient pain points in the healthcare process and drive better outcomes for the patient. Kim identified the role of technology and especially UI / UX as the solution which can begin to solve those pain points. Hants Williams, co-founder and CIO of Biovirtua shared from his experience that direct interaction with the patient is a significant part of the patient experience and engagement. It is important to note patient interactions with physicians only make up about 25% of that experience. Rather, the patient interacts more with nurses, physical therapists, social workers, dieticians and other care providers. A member of the panel shared their personal patient experience where they recounted being apprehensive of receiving treatment from providers who were less inclined to accommodate their needs or were not empathetic to their situation. This underlined the fact that patient engagement was dependant upon provider personality and not just the technology. Esther Dyson of EDventure Holdings shared that gamification in the form of incentivizing patient engagement could give traction to the adoption of patient engagement initiatives. Hants added to the idea by sharing that incentives work in the short term but tend to be less motivating in case the illness is long-term or acute. This brought the panel to the realization that for any initiative that works towards increasing patient engagement will need to have a component of driving habit formation. This raised the point that the people providing the care or the technology enabling the care played a more significant role. The consensus of the group was that it was predominantly providers who had the capacity to make patient engagement happen and technology can enable but not replace that. And in order for providers to do that, one has to understand the patient’s story and look at patient engagement as a process. The provider needs to plan to engage the patient before and after the healthcare episode. A key expectation that patients have is that they look for a trusted adviser who would direct them to the best available care. Often times it is someone they know who experienced the same ailment, but that advisor is not always available to the patient. The primary care physician (PCP) was supposed to play that role in the industry, but limited bandwidth of the PCP’s prevents them to be as engaged as patients desire. The group recognized one solution to be the training of caregivers to bridge that gap. A fairly low-tech solution but crucial, because it can lead to patient behavior change and increased engagement. Another topic that was discussed during the roundtable was whether it was possible for technology innovations in healthcare to improve quality of outcomes and lower costs at the same time. Through the discussion, the guests recognized that it was possible to do both, but historically the solutions which did so were hindered by the adoption rate or the cost of acquisition. The example that was presented was mail order pharmacy, which is inherently better than the traditional way of buying pharmaceutical products in person because of eliminating the need and cost of traveling to the pharmacy. But savings from implementing such solutions get eroded by the cost of bringing patients to start using them. In order to scale such solutions and accrue the cost savings to affect the bottom line, the solution itself needs to be easy and intuitive for the patient to adopt. The solutions need to deal with patients as people. The discussion ended with rounds of applause and an appreciation for the value of having all stakeholders at the table to solve issues impacting healthcare. Following the success of this event, we intend to continue hosting such events in the future and look forward to seeing you at our next. BioVirtua is committed to the goal of improving healthcare by focusing on the patient and is doing so by sequencing human movement, in-person and remotely without using wearable sensors to unlock quantifiable insights for rehabilitation, human performance, and telehealth encounters. To learn more about our future events, latest in healthcare or know how you can contribute to better care, head over to the BioVirtua website!